This article originally appeared in Blank News XI, October 2017. On September 19, the Mayor’s Maker Council and the Knoxville Entrepreneur Center hosted a one-day event: The Maker City Summit. Hundreds of makers, creatives, artists, professionals, and business owners shared tables at The Mill & Mine, a historic venue in the Old City, and held productive conversations on topics like Doing Business in the City; Ready, Set, Sell! ; Strategic & Sustainable Growth. But, before the summit, before Knoxville was named the first ‘Etsy Maker City’ by the global e-Commerce giant Etsy, before generous sponsors like Pilot Flying J began to support our work, Knoxville’s maker community was on the brink of its own evolution. 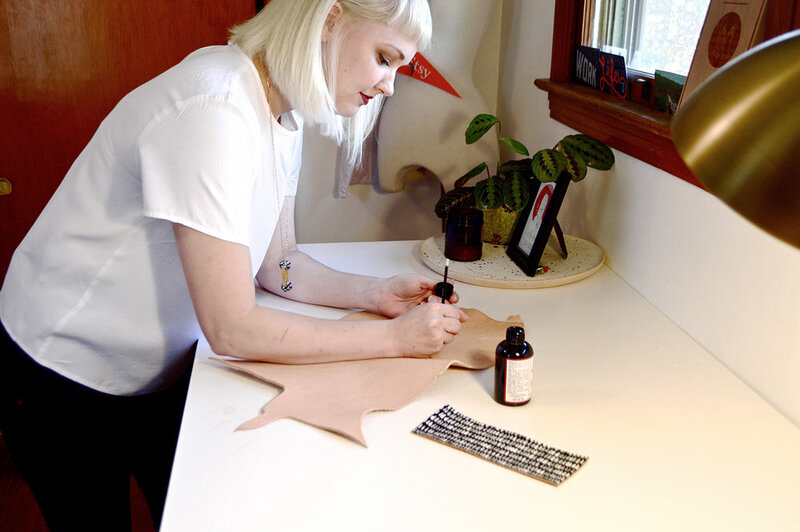 Local maker and owner of Cold Gold, Alaina Smith at her workstation. Everywhere we turn, we see new local businesses opening their doors, offering unique products, craft beer and coffee, handmade goods, and locally sustainable jobs. This surge in growth put Knoxville on the map, igniting the need for a support system and infrastructure for the rapidly expanding ‘maker’ community. Big questions were asked: Who qualifies as a “maker”? Do they have to be a business? What do these people and businesses need? Mayor Rogero during a rousing speech proclaiming Knoxville's commitment to its maker community. This mark, part of a generous brand package gifted by Designsensory to the City of Knoxville, exemplifies the claim we stake on being The Maker City. The Maker City exists to be your community network so you can make an independent living doing what you love. The Maker City is so much more than a brand – it’s a mission. Being a maker, an artist, an entrepreneur can become a solitary existence, where you alone are your production team, marketing manager, customer service specialist, accountant, and CEO; but it doesn’t have to be. A joint project with local organization ReCast City and Smart Growth America in June illuminated key community touch points for rapidly growing urban centers, which ReCast City founder Ilana Preuss spoke to at The Maker City Summit. In her presentation titled, Bold Steps in the Maker City, Preuss spoke to the need for a physical foundation for the Knoxville maker community: A brand, a physical space with diverse tenants and opportunities for collaboration, developer interest in local real estate, and support from the city’s leadership. You can imagine the swell of pride in the standing-room-only hall when we could confidently check each one of those boxes. Yet, our work has only just begun. With the foundation in place and goals driving our actions toward a more inclusive and connected maker network, we call upon YOU, a maker – consumer – provider in Knoxville, to join us in this effort to solidify our status as The Maker City.